Happy New Year guys! I hope everybody enjoyed the holidays and the scrumptious foods specially prepared for New Year ’s Eve. I admit I gained a couple pounds since Christmas. I can’t help eating the leftovers. You know when it comes to food I don’t want to throw anything away. So even if I prepared a little for the family, we still have some leftovers. As of today, I’m still trying to finish the chicken macaroni salad, which tastes better, by the way, the longer it sits in the fridge. We also have some leftover maja blanca, biko, and humba. Anyway, because my husband wanted something different to eat for dinner, I made this family favorite—sweet and sour pork and also cooked some fresh boiled rice to go with it. This is relatively easy to make and delicious, although it takes almost an hour just because you have to marinate the meat first for better flavor. 1. In a medium mixing bowl, add all the ingredients for marinade: soy sauce, sugar, black pepper, and 1 egg. Use a fork to beat the egg and mix with the rest of the ingredients. 2. Add sliced pork and mix with the marinade. Set aside for at least 30 minutes. 3. In a medium bowl, drain pineapple juice. Set aside the pineapple chunks for later. Add the rest of the ingredients for making the sweet and sour sauce (check the ingredients list above). Stir and set aside. 4. Prepare the rest of the ingredients for sautéing. a. Core bell peppers to discard the seeds and slice into triangles or squares. b. Peel onion, and cut into chunks. c. Smash garlic with the side of the knife. Peel and mince afterwards. 5. 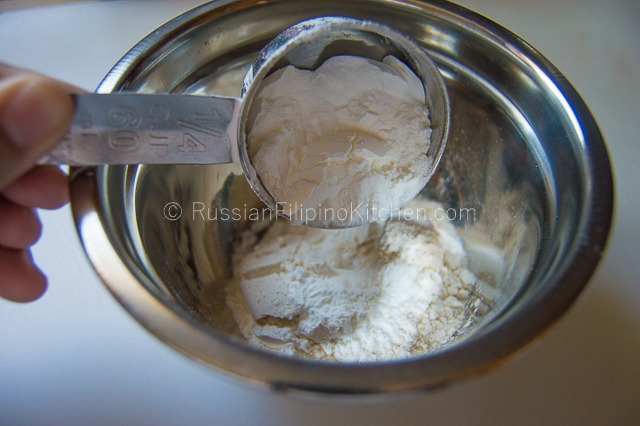 Prepare breading for the meat by combining flour and cornstarch in a bowl. Coat each pork slice with the breading and set aside for frying. 6. In a frying pan, heat 2 cups of oil until it gets very hot. Deep fry breaded pork slices until they’re golden brown, about 3-4 minutes. Don’t fry all of them at once but do it in 2-3 batches so they cook evenly and the pan doesn’t get over crowded. Transfer fried pork pieces onto a plate. 7. Heat a large skillet or cooking pan over medium high heat. Add 2 tablespoons of oil from the frying pan in step 6. 8. Saute onions and garlic until onions get translucent and garlic has browned a bit, about 2-3 minutes. 9. Throw in the bell peppers and sauté for another 2 minutes. 10. Add the pineapple chunks and sauté for another minute. 11. Pour in the sweet and sour sauce. Also add the fried pork pieces and bring pot to a boil. 12. Once it boils, turn down the heat a little and simmer for 3-4 minutes to further soften the bell peppers and for the sauce to thicken a bit. 13. Remove from heat and serve, preferably with warm boiled white rice. In a medium mixing bowl, add all the ingredients for marinade: soy sauce, sugar, black pepper, and 1 egg. Use a fork to beat the egg and mix with the rest of the ingredients. Add sliced pork and mix with the marinade. Set aside for at least 30 minutes. In a medium bowl, drain pineapple juice. Set aside the pineapple chunks for later. Add the rest of the ingredients for making the sweet and sour sauce (check the ingredients list above). Stir and set aside. Prepare the rest of the ingredients for sautéing. a. Core bell peppers to discard the seeds and slice into triangles or squares. b. Peel onion, and cut into chunks. c. Smash garlic with the side of the knife. Peel and mince afterwards. Prepare breading for the meat by combining flour and cornstarch in a bowl. Coat each pork slice with the breading and set aside for frying. In a frying pan, heat 2 cups of oil until it gets very hot. Deep fry breaded pork slices until they’re golden brown, about 3-4 minutes. Do not fry all of them at once but do it in 2-3 batches so they cook evenly and the pan doesn’t get over crowded. Transfer fried pork pieces onto a plate. Heat a large skillet or cooking pan over medium high heat. Add 2 tablespoons of oil from the frying pan in step 6. Saute onions and garlic until onions get translucent and garlic has browned a bit, about 2-3 minutes. Throw in the bell peppers and sauté for another 2 minutes. Add the pineapple chunks and sauté for another minute. Pour in the sweet and sour sauce. Also add the fried pork pieces and bring pot to a boil. Once it boils, turn down the heat a little and simmer for 3-4 minutes to further soften the bell peppers and for the sauce to thicken a bit. Remove from heat and serve, preferably with warm boiled white rice. So bright, crisp and pretty. How do you think this would be with banana ketchup? Thanks! It would be sweeter if you use banana ketchup. You just have to adjust the vinegar, unless you’re okay with the taste. Crazy nice colors! This meal is just happiness. I have tried this and it tasted so great! The whole family love it. Thanks for sharing Mia.